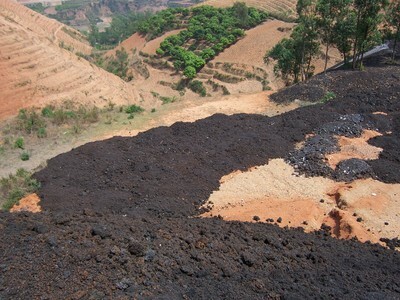 The most common pollution problem for an active mine arises from the disposal of mineral wastes, mainly mine waste rock and tailings. Mine waste rock is the material removed to access or expose the valuable ore and is typically enriched in some constituents of the geochemistry of the ore. Tailings are the waste materials after the minerals are separated from the ore in a mineral processing plant.1 They typically contain the valuable constituents in low concentrations, unrecovered by the process, and may also contain toxic residues of chemicals used in the separation process. Economic ore deposits contain many chemical elements in addition to those that are extracted for sale. Some of these are toxic, and they are often present at concentrations that pose risks to the environment and human health. These elements can occur in mineral waste repositories and in the exposed walls of excavations. They can be leached from both sources, transported by wind, or taken up by plants and animals in the human food chain. Physical agents such as asbestos and crystalline silica can also be windborne, and radioactive minerals pose their own set of risks. Substances emitted from or present at mine sites can enter the body in a variety of ways such as inhalation, absorption through dermal contact, or ingestion of contaminated food and water. A number of health effects may result from active mine pollution depending on the specific substances present and their concentrations in air, soil, food or water. Unless a major accident occurs, the effects are often chronic in nature3 and include irritation of eyes, throat, nose, skin; diseases of the digestive tract, respiratory system, blood circulation system, kidney, liver; a variety of cancers; nervous system damage; developmental problems; and birth defects. 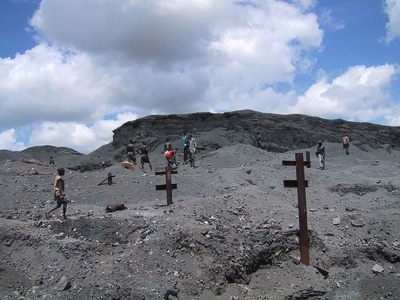 The aim of environmental regulation of mining operations by governments is to improve performance and to reduce emissions and the risks they pose to the environment and human health. Problems arise either when the law does not set strict enough limits on permitted emissions or where there is no effective enforcement of applicable laws, or both. In such cases companies may undertake voluntary emission reduction programs, often under pressure from civil society organizations. Such initiatives include installation of effective wastewater treatment, alternative waste disposal methods for mine tailings, etc. 2 Briones, Nicomedes D. ”Mining Pollution: the Case of the Baguio Mining District, the Philippines.” Environment and Policy Institute. East-West Center. Volume 11, Number 3: July 1987. 3 Balkau, F. “Pollution Prevention and Abatement Guidelines for the Mining Industry.” UNEP. 1994. Page 4. Huaning, China. Photo by Blacksmith Institute. Scavenging the mines. Kabwe, Zambia. Photo by Blacksmith Institute.